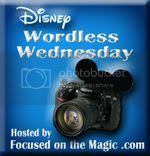 OK, this post isn't "wordless"- but my Instagrams usually are (except for hashtags, of course)! One of my favorite ways to use Instagram is to participate in Disney photo-a-day challenges, posted monthly by Disney fans. A hashtagged word or phrase is selected for each day, and fans post pictures to go along with that day's hashtag. It's a fun way to share Disney memories, and it's a great way to connect with other fans. The two I usually participate in are the #disaday challenge from @mainstgazette, and the #whimsicaldisneygram challenge from @sparklynicole and @zannaland. Can you recommend any others? Check out Plus the Magic on Instagram here! Well this is something I never knew about KJ! As you saw in June, I am a total iPad/Instagram newcomer, but these challenges might just break me in. Thanks for the tips!! Great idea linking right to your instagram account and so much fun seeing all the cute pictures. Must admit the garbage can shots are my favorite! I followed you on Instagram! Thanks for the great pics! Great instagram shots - I'm now following along :) Thanks also for the reminder of the daily challenges - such a fun idea! You have great Instagram pictures! I love seeing the photo a day challenges but by the time I see them the day has usually passed. I'll have to try harder, it looks like fun! Just followed you on Instagram (bad me for not doing it earlier). Love the Disney challenge and need to join in one of these times. Cool graphic & great shots on Instagram! We're totally new to instagram! We'll have to check these out!! Thanks for sharing!